Identity Guard is an award winning US-based identity theft protection service with a distinguished thirteen-year history. With a proven track record of protecting the identity and financial security of its customers, Identity Guard has received a number of industry awards in recent years - testament to the quality of its service. Javelin, the consumer survey analysts, rated Identity Guard as highest in its class (ID protection services) in 2009. It provides a flexible system to protect the identity of you and your family. You can choose from three different packages, each available for 2 weeks under a free trial period, all providing various benefits. As you’ll see from our features list, the gold package (the cheapest of the three) includes a wide range of features. Upgrading to platinum isn’t much more expensive but essentially provides a more in depth level of research. You might also be interested in the free PC security software made available through the platinum and platinum+ packages, which will provide protection for you whilst browsing, shopping and banking on the internet. This offers particularly good value because for approximately $5 extra per month you will have the protection of a professional anti-virus package. As well as this protection you can also utilise the keystroke and password protection which will prevent identity thieves from being able to track what you type (even if they cannot see it on the screen, such as passwords). If you have children and are concerned that their identities may be at risk from identity theft then you may be interested in IdentityGuard’s platinum+ package using their KidSure protection plan which allows you to cover your kids. This differs from most adult protection systems which rely on bank details and credit checks, rather it pays more attention to a child’s name and any documents associated with them (after all kids tend not to have bank accounts or credit cards!). The site includes a resource centre which contains articles, blog posts, eBooks, forms and audio. This provides a lot of vital information for finding out about how to protect your identity. It’s also good to see a range of approaches to providing this information, rather than just simply masses of text. If you’re looking for help then the site’s FAQ answers all of your key questions and you’ll also be able to contact customer support via email or by phone. You can also find information based on key words and topics, or search the resource centre to find something more specific. Identity Guard also provides all users with an ID Vault USB dongle, which can be used to carry and protect personal passwords and data. In order to use ID Vault to its full potential, simply load all the passwords and ID's needed for internet banking, online shopping and more onto the dongle, and protect them all with encryption and a PIN code. In order to use this data, simply plug in the USB dongle, enter the PIN and you're ready to go. To select a password, simply add it from the list of stored data. This way, you don't need to remember multiple passwords, too! IdentityGuard provides a 2 week free trial period of each of its packages, which is a good way to get an idea of how effective their systems are and how useful they might be to you. However, you need to make sure that you call to cancel your membership if you do not wish to pay for the service, or you will be automatically charged. You can also purchase some optional extras if you have the gold package, including child identity protection. Whether or not it is worthwhile simply upgrading from gold to premier, rather than purchasing the optional extras, is worth considering, though. 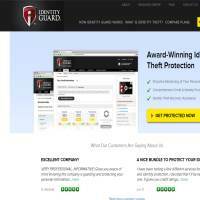 Identity Guard's free trial is certainly worth a try considering its vast collection of useful, ID protecting features. Firstly, all users get a 3-in-1 credit report, assembled from the three major US credit bureaus (Equifax, Experian and Trans-Union), four times every year. These reports can be used to examine your credit record for any suspicious transactions, and also allow users to place credit alerts on their account in order to protect their credit (and identity) by ensuring that all new transactions must receive prior authorisation. Identity Guard also provides users with a complete internet security suite, Zone Alarm, which protects computers and Internet use from hacking and viruses. Zone Alarm includes built-in anti-virus software, which can be updated online to provide maximum protection, and built-in anti-key logging software to stop Identity Guard users being hacked from a distance over wireless networks. All in all, Zone Alarm can save users hundreds of dollars in additional software that would otherwise be needed to protect their home computers. Overall the range of packages available on Identity Guard makes it suitable for a range of people and budgets. It’s worth taking some time to explore the differences between each package to help you decide if any of them might suit your needs. Even if you decide that you’re going to look elsewhere, the free articles and blog posts on this site will help inform the protection of your identity in the future.